Margaret’s friend Jacqui brought a special guest to the Weavers’ Workshop. 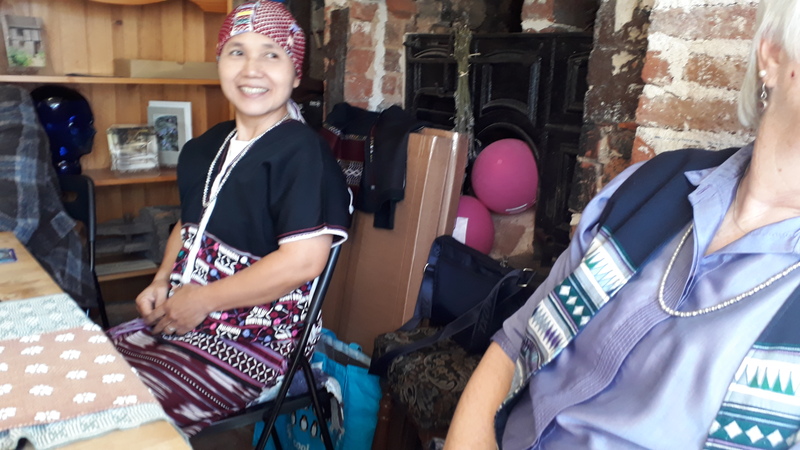 She is from Thailand, studying English here in the U.K. and is a weaver. She brought some fantastic fine work to show us. 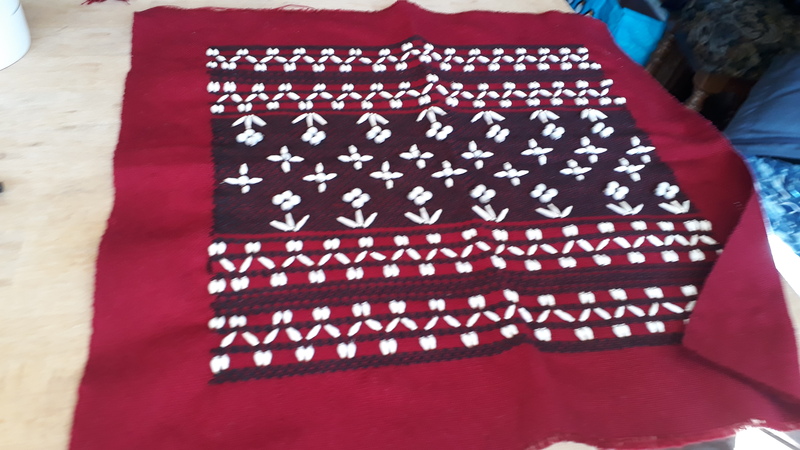 The cloth is so colourful and the items you see here are tops and skirts. 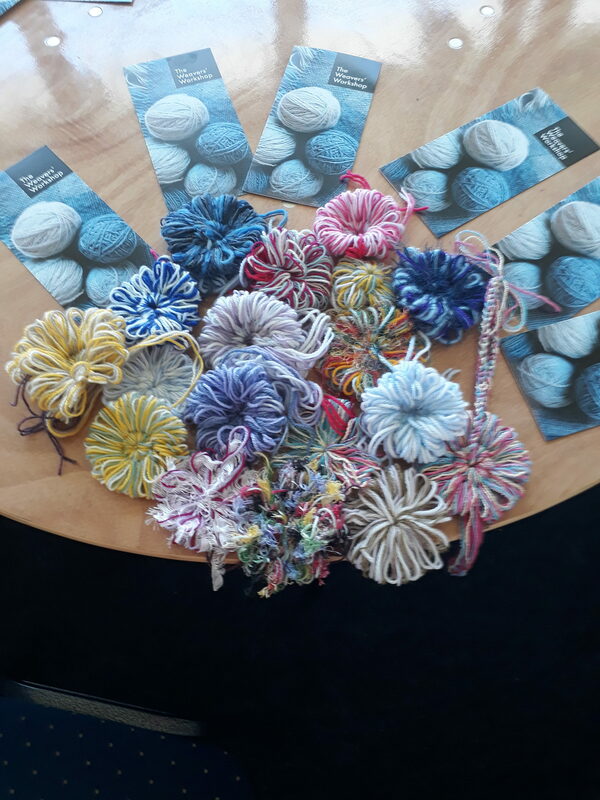 The Workshop (drop in) will not be open on 11th October 2018. The Weavers’ Workshop will be closed on 27th August. 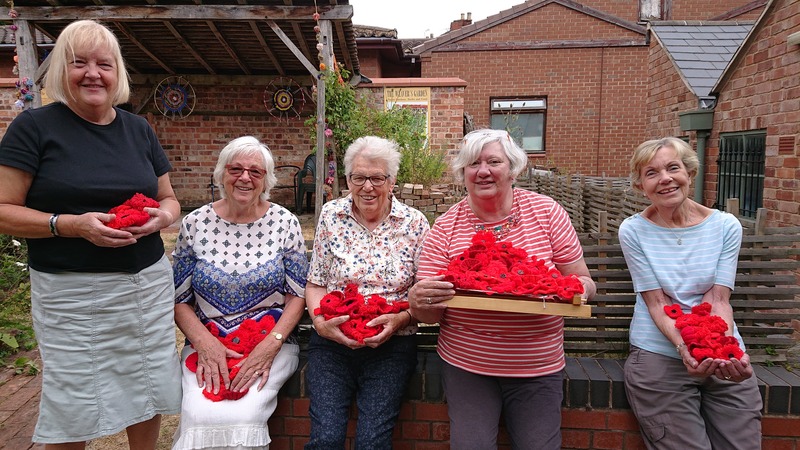 Weavers made 200 poppies which were woven, knitted and crocheted for the church. 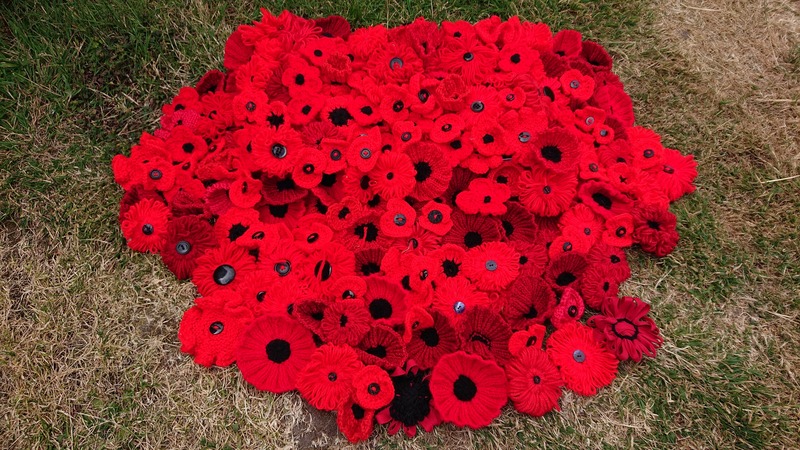 These will be used as part of an art installation commemorating the end of World War 1. Helen Fitzpatrick, in charge of the project and seen on the left was delighted with our gift to the church and the community. The Weavers’ Workshop were invited to take part in a group banner-making session as part of celebrating 100 years of women’s suffrage. 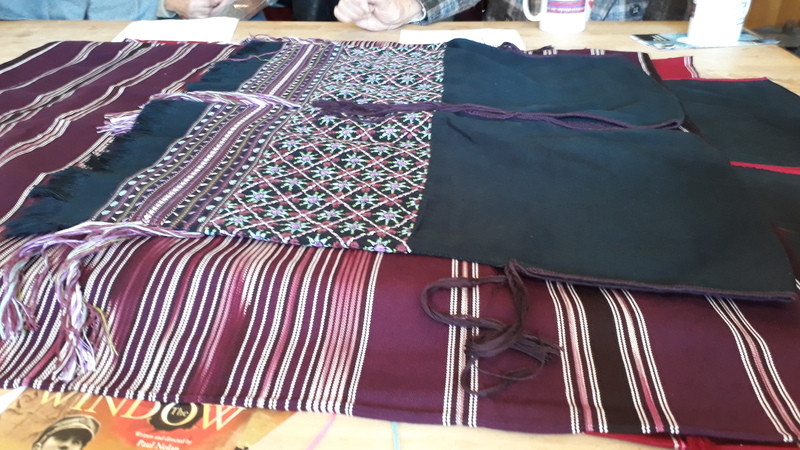 A number of making sessions took place at the Oasis cafe, the Foleshill Women’s Training Centre and at Eaton House where participants stitched pansies in the style and colours of the suffragette movement, green, purple and white. To these we added the names of people who inspired us – both men and women and then attached them to a printed graffiti wall, stitched with words relevant to women’s fight for the vote such as justice and equality, along with a the striking image of a suffragette. A group of us involved in the banner making, including weavers Janet and Sara, travelled down to London on 10th June to join tens of thousands of other women marching from Marble Arch to the Houses of Parliament to mark the extraordinary battle by the suffragists and suffragettes for the women’s vote, finally achieved in 1918. The day of the march was remarkable for the fellowship, atmosphere and sheer numbers involved from across the UK. 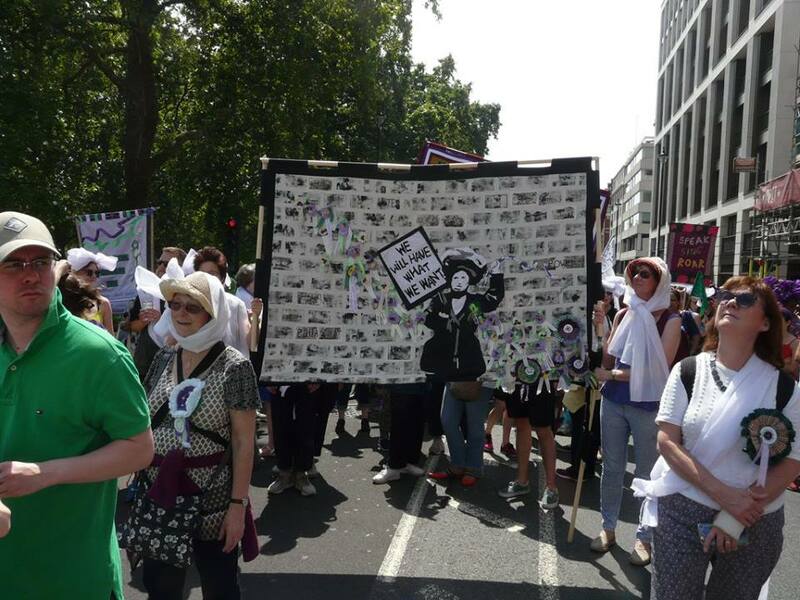 There were many glorious banners on show including our own, demonstrating the importance and value women attach to their right to vote and it was a privilege to be part of this historic moment. 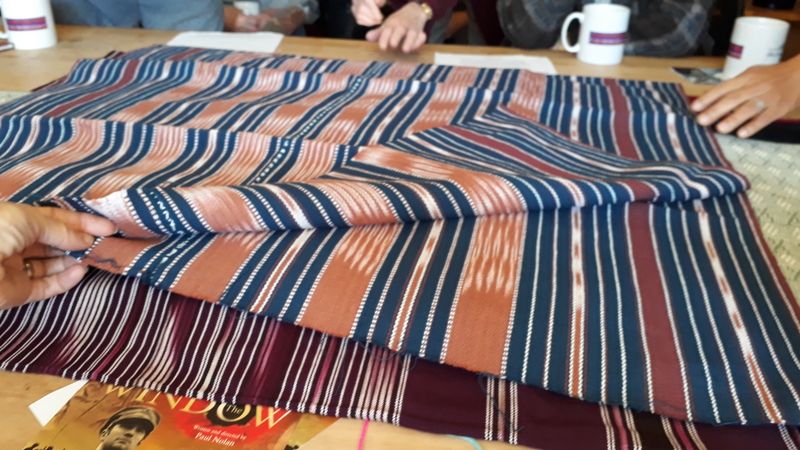 The banner project was ably led by Anne Forgan and Mindy Chillery of ArtSpace and the weavers were pleased to be able to contribute and be part of a conversation about what the vote means to us. 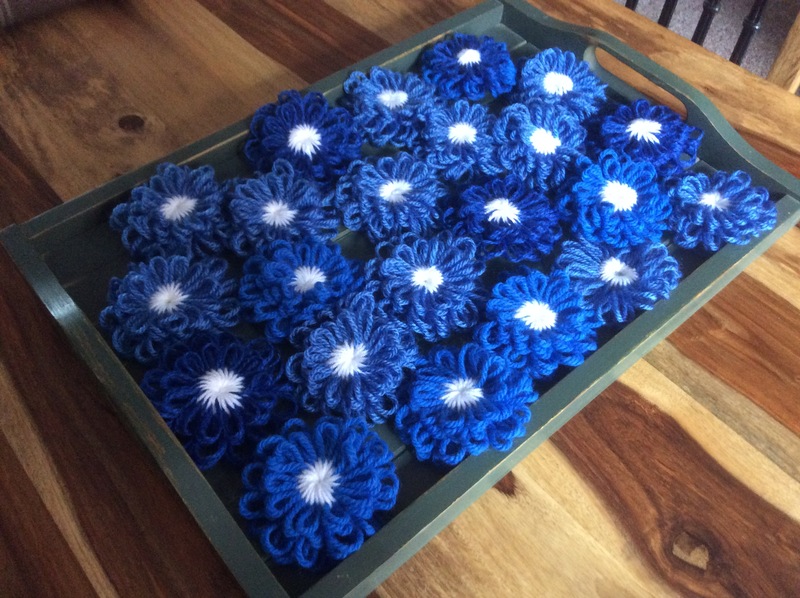 Today we met several lovely people at the Cafe who tried their hands at weaving flowers and what a super bouquet was made by them. Everyone enjoyed the morning (including weavers). Thanks for inviting us.